Margaret “Peggy” Fisher an artist and teacher of long-standing received several awards throughout her fifty-plus year career, including the Citation for Notable Achievement in the Arts awarded by the American Association of University Women, Arlington, Virginia branch. Mrs. Fisher was an accomplished poet “Peggy’s” watercolors and paintings were naturally the first works displayed in the 417 square foot gallery. The exhibit’s opening reception was on September 29, 2001 and the show graced the gallery through the end of that year. Joseph L. Fisher, Margaret’s husband of 50 years, was also noted for his service to the local community. For 12 years he was a member of the Arlington County Board, serving as its Chair three times. He was a member of the United States Congress, representing Arlington, Fairfax and Loudoun Counties from 1975 through 1981. 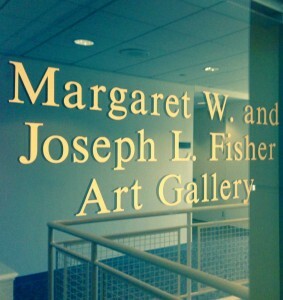 The Margaret W. & Joseph L. Fisher Art Gallery is located on the second level of the Rachel M. Schlesinger Concert Hall and Arts Center, 4915 East Campus Drive, Alexandria, VA 22311, and is a part of Northern Virginia Community College’s Alexandria Campus. The galleries are open from 10 a.m. to 4 p.m. Monday through Friday and during concert hall events. For additional information about art shows and concert hall events, call the Schlesinger Center at 703.845.6156.